Parkinson’s UK’s annual photography competition, ‘Picturing Parkinson’s’, is held in memory of scientist Dr Jonathan Stevens, who lived with Parkinson’s disease and passed away two years ago, aged 34. 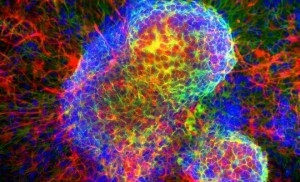 This year’s winning and runner-up images reveal the complexities of the millions of nerve cells and proteins that make up the brain. The gallery below shows some of the stunning photographic highlights. The full set of submissions can be viewed here. 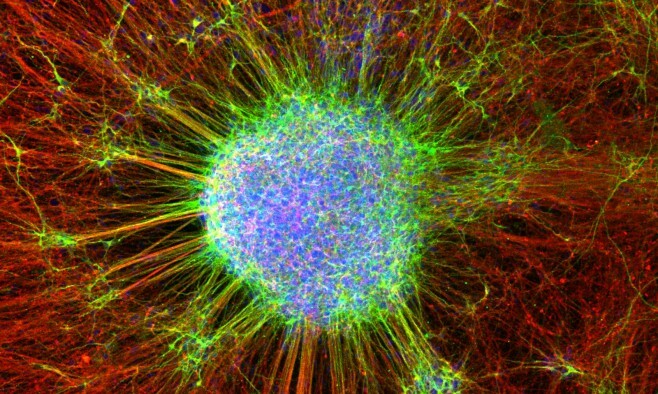 Stem cells from a person with Parkinson’s can be turned into a basic brain cell that can produce millions of densely connected adult brain cells. 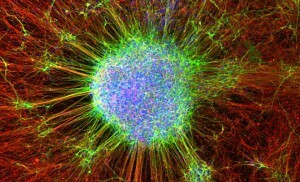 The cell bodies are shown in blue, while the long tendril-like processes, which the cells use to communicate with other parts of the brain, are in red and green. 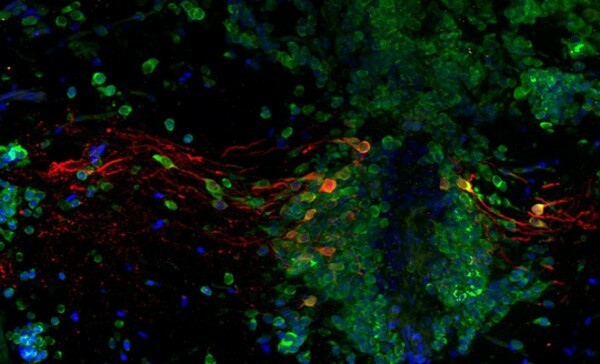 This is a section of a Zebrafish brain where the brain cells have been stained green. Zebrafish are used to study a protein in Parkinson’s called alpha-synuclein, shown in red. This picture shows what brain cells grown in a dish look like under the microscope. The different colours and shapes represent important features of these cells that are also present in the brains of people with Parkinson’s. 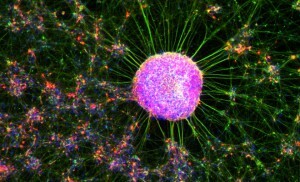 This image shows the complexity of the developing brain cells. This research aims to help identify the environmental elements necessary to grow stem cells for use in therapeutic treatments for people with Parkinson’s and other neurodegenerative diseases. 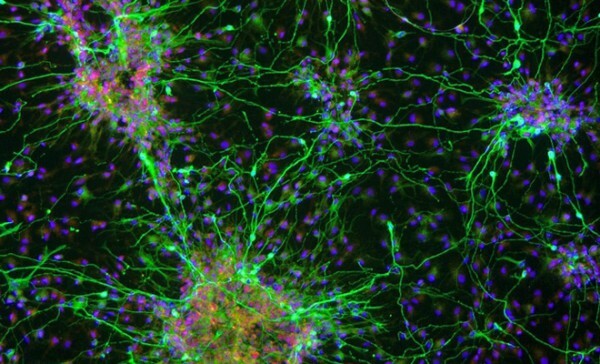 These human brain cells (seen here in red) have been made from stem cells. 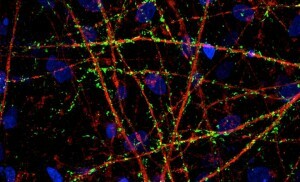 They allow us to study the function and dysfunction of proteins involved in Parkinson’s – in green. This image shows the synapses – proteins gathered at the sites of brain cell communication. These skin cells show the intricate patterns made by the mitochondria – tiny energy-producing structures that power a cell. In Parkinson’s, these cellular batteries and the waste disposal system of the cell are faulty. 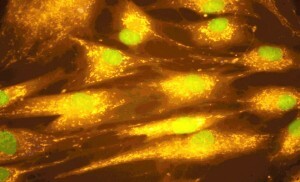 This image shows brain cells that are created from the skin cells of people with Parkinson’s. 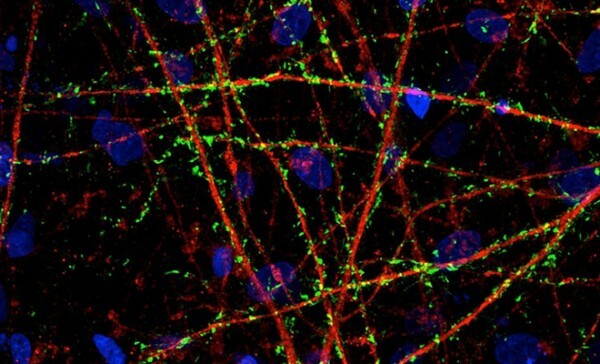 Dopamine producing brain cells, the type most vulnerable in Parkinson’s, are shown in green. These cells can form huge clumps of cells that can even be seen with the naked eye.